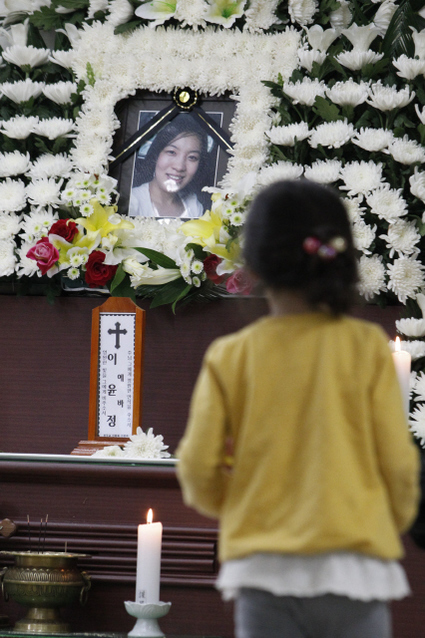 Lee Yun-jeong, 32, died from cancer in May. She worked with semiconductors for years. Not long ago I received an email, an open letter from the Asian Transnational Corporation Monitoring Network (ATNC) forwarded from the Asian Human Rights Commission (AHRC). 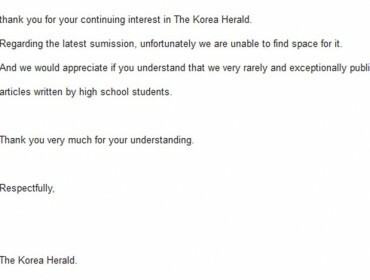 This letter was addressed squarely at Samsung and the Korean government. Its focus was on the growing number of deaths of Samsung semiconductor workers from various forms of cancer, and Samsung’s seemingly obstructive and morally dubious response to this growing cluster of illnesses and deaths among its manufacturing workforce. On May 7 this year, Lee Yun-jeong, a 32-year-old Samsung semiconductor worker finally lost her battle against brain cancer. Ms. Lee worked for Samsung at its semiconductor assembly and test factory in Onyang, from 1997 to 2003. In 2010, she was diagnosed with brain cancer. Lee Yun-jeong had applied for Workers’ Compensation from the government, which would have gone some way toward helping pay for the expensive medical treatment she needed. According to the ATNC, author Elizabeth Grossman and the Korean newspaper, The Hankyoreh, Lee Yun-jeong was not alone in suffering this double blow of being diagnosed with a terminal illness while being shunned by the employer she faithfully worked for. In 2005, Han Hae-kyoung who had worked in a Samsung LCD plant since 1995, was diagnosed with a brain tumor and is now seriously disabled. 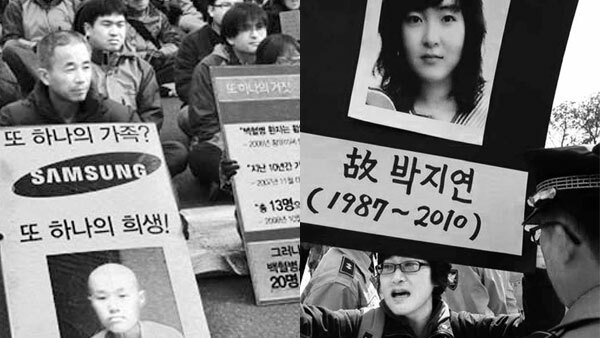 In 2007, 22-year-old Yu Mi-hwang died of Leukemia. She had worked since high school at Samsung’s Giheung semiconductor plant. In 2010, 23-year-old Park Ji-Yeon, also died after being diagnosed with leukemia. She had worked at Samsung’s On-Yang semiconductor plant since 2004. Labor and occupational health activists, the letter claims have counted 120 such cases of serious illness and 46 resulting deaths among Samsung workers. Elizabeth Grossman writing in Yale’s Environment 360, quotes Dr. Kong Jeong-ok, a specialist in the field, who has collated data on these numerous cases for the Korea Institute of Labor Safety and Health (KILSH). Resulting studies by KILSH and SHARPS (Supporters of Health and Rights of People in the Semiconductor Industry) have recorded that 74 people who had worked in semiconductor plants had fallen seriously ill. Of this number, 26 have died. A further 15 LCD plant workers have fallen ill, and five have been known to have died; so that’s 89 workers that have fallen seriously ill, and 31 have died. And this is believed to be only the tip of the iceberg. 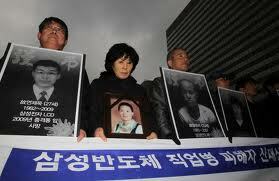 Family members of Samsung employees who died from cancer protest. So having received this email while suffering from chronic human rights violation fatigue, and knowing from the first few lines how this story was going to pan out, I logged off, and chose to give my conscience the day off. 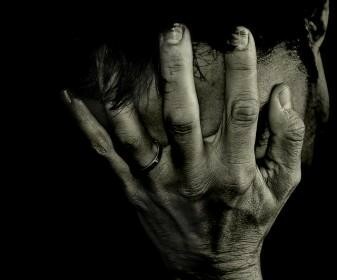 But having a conscience is not so easily side stepped. A conscience is more like having a loose tooth that’s catching on a nerve; it cannot be readily ignored for long without painful consequences. As much as we in this Huxleyan century crave nothing more than to see only as far as the screens of our smart phones and tablets, actually feelings are not as easily uninstalled as your common or garden app. The image of the semiconductor industry manned by white-coated and well-educated and be-masked technicians pouring over immaculately high-tech machinery in a sterile and clean environment is just that, an image. It is a myth is all; or a misapprehension; those white coats, gloves and masks are to protect the intricate parts that make up the smart phones, computers and LCD televisions; not to protect the workers from the vast smorgasbord of chemicals used within these supposedly “clean rooms.” For example, in March 2011, Unite, the largest manufacturing union in the UK released a brief to the media calling for an inquiry into cancer risks in the semiconductor manufacturing industry. Unite welcomed research done in the United States by Dr. Richard Clapp of Boston University; whose study looking at the deaths of men and women who had worked for IBM found “significantly greater” cancer deaths than the national average. I will look at Dr. Clapp’s findings in more detail later. According to the British Health and Safety Executive, there are a number of toxic, suspected carcinogenic and carcinogenic substances used in a variety of processes in the semiconductor manufacturing industry, worldwide. For example: The process of ion implantation in which atoms are ionized, speeded up and directed at a target, usually a silicon substrate. The atoms reach such speed that they collide with the target’s atoms, lose energy and come to rest in the solid. This process needs antimony trioxide, arsenic and arsenical compounds, arsine, boron trichloride, boron trifuluoride, phosphine and phosphorous oxychloride: Does arsenic need any introduction? Chemical vapor desposition occurs in many semiconductor wafer fabrication processes, and uses arsine and phosphine. Bonding, which is the binding of code and data, uses antimony trioxide and beryllium oxide. The precious forms of its mineral beryl are aquamarine and emerald. 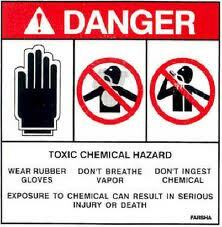 This metal, its alloys, and compounds are toxic and need to be handled with care. One needs to especially avoid inhaling their dust and vapors. The stripping of developed photoresist (which is a wafer cleaning technique) uses hydroxylamine, naphthalene, phenol and sulphuric acid mists. The latter speak for themselves but phenol I had to look for in an encyclopedia. It is a toxic organic compound with various uses; it is the chemical base from which aspirin is made; Bakelite, one of the first synthetic resins was made from a phenol polymer. It is used in cosmetic surgery as an exfoliant; and whatever your views on plastic surgery, it is nothing compared to the sinister use it was put to by the Nazis in Auschwitz-Birkenau. Where it was as a means of execution and applied via injection. Wafer cleaning uses sulphuric acid and the process of etching uses hydrochloric acid. Semiconductor manufacturing workers not only have to work in an environment heavy with chemicals and metals but also electro-magnetic fields (especially untraviolet light, radio frequency, and also in one process, x-ray radiation). It is no wonder to my un-scientific mind that people are developing various forms of cancer in these facilities. More importantly the rates of cases of serious illness and death from various forms of cancer amongst semiconductor manufacturing workers are markedly higher than that of the general population. A study of workers at a Scottish semiconductor plant was conducted by the government occupational health authority in 2001. This study showed statistically significant excesses of lung, stomach and breast cancer among females and an excess of brain cancer among males; however the number of employees in this plant was relatively small and the number of cases was limited. Follow ups to this research were recently made, and a previous high level of melanoma persisted, as well as high levels of rectal and pancreatic cancer in females. Two studies done in Taiwan of workers, who made main and circuit boards for computers in an electronics company, showed a high level of breast cancer in female workers when compared to other industrial workers. In a similar vein, Dr. Richard Clapp of Boston University clearly states in his study “Mortality among U.S. employees of a large computer manufacturing company (1969- 2001)” that though certain forms of cancer were significantly reduced in both male and female workers, proportional cancer mortality ratios for brain and central nervous system cancer were elevated. Similarly kidney cancer, melanoma of skin and pancreatic cancer were significantly elevated in male manufacturing workers. And cancer of the breast, kidney, cancer of the central nervous system, melanoma of skin and Non-Hodgkin’s lymphoma were significantly elevated in female manufacturing workers. In conclusion Dr. Clapp states, “We found an overall excess mortality for all cancer in males and females” in the entire group data used for his research. Which in layman’s terms means that compared to an average person, employees engaged in the manufacture of semiconductors for IBM, were more likely to die from all forms of cancer. 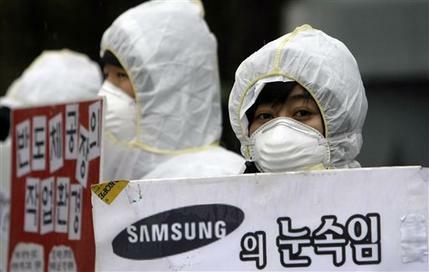 South Korean Activists protest near a Samsung semiconductor factory. Having looked at research done on the links between exposure within the semiconductor manufacturing industry in the United States, the UK and Taiwan, I will now take a specific look at two reports published by the Occupational Safety and Health Research Institute, the first of which was published in 2008; of this study Dankook University Occupational Medicine professor, Roh Sang-chul said that it “is the first evidence in which the possibility of a connection between the semi-conductor industry and worker diseases has been presented” (though he acknowledges the limitations of the study, more of which later). The second study, published in June 30, 2011, in Safety and Health at Work; Vol 2, N0 2, is “Cancer Mortality and Incidence in Korean Semiconductor Workers”; which was written by Hye-eun Lee, Kim Eun-a, Park Jung-sun and Kang Seong-Kyu, (Lee HE et al) at the Occupational Safety and Health Research Institute. The article starts unsurprisingly with the study’s objectives, methods, results and conclusions. In the conclusion, Lee HE et al, quite amazingly claim that even though the incidences of Non-Hodgkin’s Lymphoma (NHL) in females and thyroid cancer in males were significantly increased “there was no definitive association between work and those diseases.” This statement of intent leaves me wondering about the independence and integrity of this research group; affiliated as it is with the (governmental) Korean Occupational Safety and Health Agency (KOSHA). My next point of concern was in the introduction where Dr. R Clapp’s seminal study of semiconductor workers at IBM from 1969- 2001 is dismissed as having achieved nothing; having “not provided consistent evidence that exposures in the industry were associated with cancer.” The same goes for the two studies of the National Semiconductor in Greenock, Scotland. Though all of this is done without mentioning any names, the effect is just the same. Curiously it also went on to state that “incidences in groups with short work durations and those most recently employed were significantly higher than expected.” Lee HE et al then go on to claim this fact denies “the presence of an occupational carcinogen.” In the next sentence they seem to contradict their previous statement by stating, “the possibility of work relatedness of NHL in semiconductor workers could not be ignored because subgroup analysis had more uncertainty for low numbers” and “employment duration or employment years could not substitute for exposure level completely”: This also runs counter to claims made in the conclusion and introduction that no definitive links could be made between exposure in the semiconductor industry and incidences of cancer. However Lee HE et al. have admitted that there were quite significant limitations to their study. The study group was built in 1998 but almost all the factories were up and running before 1998, so many earlier workers were excluded from the study. Unlike say Dr. R Clapp’s study “Mortality among US employees of a large computer manufacturing company: 1969-2001” the observed period (6.6 years for incidence and 7.5 years for mortality) was not long enough to obtain stable results of cancer risk. This is a bombshell. In the UK National Semiconductor study the mean length of follow up was 12.5 years, and the U.S. IBM factories were studied for more than 30 years. Now considering the casual dismissal of other studies for supposed inconsistency, and failure to definitively show a link between exposure in the semiconductor industry and incidences of cancer, this is surely deeply hypocritical, and could even be construed as criminal, considering the lives of many Samsung semi-conductors workers are at risk. This study the authors admit was not long enough to get “stable results of cancer risk,” and is therefore incomplete, so should not have been published until a decent follow up period could’ve been observed and information gathered: Then and only then should this study have seen the light of day. I think the Korean authors mis-state the facts in the section you quote in your message below. In the past few years, there have been several studies pointing to excess cancer risk in semiconductor and computer manufacturing workers. I mention these in my 2006 and 2008 articles. Even the IBM-funded study by Beall, et al. (2005) shows increased brain cancer mortality in at least one manufacturing plant. As a result, the company has decided to commission a further study of just brain cancer in their big manufacturing plants. In addition, the National Institute for Occupational Safety and Health is currently carrying out a study of IBM workers at the Endicott, New York plant. These further studies will add to the growing literature about cancer risks in this industry. Let me know if you have further questions. Park Ji-Yeon, 23, died in 2010 after being diagnosed with leukemia. She had worked at Samsung’s On-Yang semiconductor plant since 2004. Two articles from the English language press appear pertinent to the issues being raised here. In the April 11 edition of the Korea Times, there is a small article barely five paragraphs long by Yi Whan-woo, which states, “Samsung Electronics admitted that it caused an industrial accident that resulted in a former female employee suffering from thrombositopenia and anemia.” The word used is “accident” which suggests a one-off incident; an anomalous break from protocol and norms that was somehow out of Samsung Electronics’ hands. And which was therefore (even though it has admitted culpability) not Samsung’s fault. That is how I read the choice of the word “accident.’’ However in paragraph two, a Ministry of Labor spokesperson is quoted as saying “the world’s top electronics firm admitted the working environment of its microchips plant caused the 37-year-old woman to become sick after working there for about four years.” The article continues, “The woman worked in the microchip factory until 1999 when she showed symptoms of thrombocytopenia and anemia and could not work any longer. Samsung said that her symptoms developed, possibly due to exposure to toxic chemicals such as benzene and formaldehyde used at the plant.” If this is correct then this is groundbreaking news. This could be when Samsung truly comes of age, and like its American peer IBM turns over a new leaf. And, finally, seriously-ill former Samsung workers and the families of those who have already died receive the compensation they need and deserve, without having to fight the company every inch of the way. Do you remember I mentioned a young Samsung worker, Lee Yun-jeong, who worked from 1997 to 2003 at Samsung’s semi-conductor Assembly & Test factory in Onyang. She died on the May 7 this year after losing her battle with cancer. I watched a video made by activists from SHARPS (Supporters For the Health and Rights of People in the semiconductor industry) in which Lee Yun-jeong’s mother talked despairingly about her daughter’s medical needs, lack of funds and what she perceived as Samsung’s indifference to her daughter’s fate. She said that someone from Samsung had handed her an envelope with approximately 7 million won (a little more than $6,100)–allegedly it was a collection from Lee’s colleagues. Only months later did she see any other representatives of Samsung; by which time Lee Yun-jeong was on her death bed and her mother threw them out. Yet Samsung Electronics “made a record profit of $5.1 billion in the first quarter of this year, powered by impressive sales of its Galaxy Note and smart phones.” Now the talk is of increased capital spending by 25%, that’s some $17 billion. Surely a company making such handsome profits could afford to ease the final years of loyal workers, who have been unfortunately diagnosed with cancer? This whole thing puts a horribly bitter spin on the phrase “from the cradle to the grave.” I’m sure Lee Yun-jeong didn’t think it would all end so cruelly and so soon. 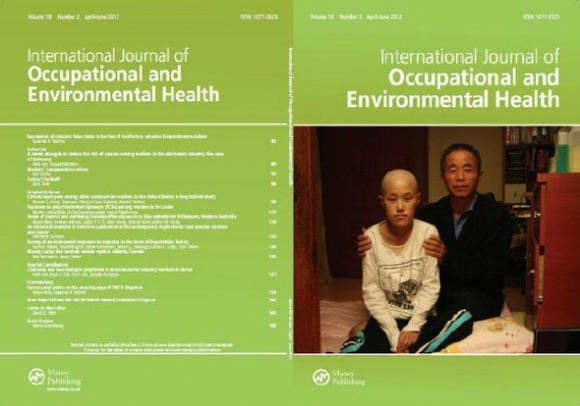 The International Journal of Occupational and Environmental Health covered the topic in its April-June, 2012 issue. Samsung Electronics has the money and resources to invest big, and do the right thing by its workers whether they fall ill or not. This is part of what the ATNC demand in their open letter. The ATNC also demands an apology from Samsung Electronics and the Korean government for the way the company had treated former worker, Lee Yun-jeong. Though I’m not sure how likely that is to happen. Another ATNC demand is that Samsung “stop undermining the right of workers to be compensated, and respect labor rights.” The latter is a well known issue in South Korea, that the Samsung Company (is fiercely anti-union) and a union free zone, in strict contradiction of the rules of the country concerning the legal and democratic right of workers to form unions to protect their rights and interests. 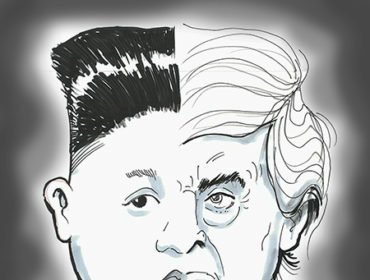 Then again, South Korea is not a hundred percent democratic. Unions are prohibited by law from funding both political parties and individual candidates for election. If this was the case in my country, the Labour Party would not exist; it would not have won a landslide victory in the national elections in 1945, nor created the National Health Service. Yet in South Korea, this is the status quo. We urge the Korean government and Samsung to fulfill its responsibility for compensating occupational disease victims and respect the dignity and the solemn rights of all workers and their families. The international communities, trade unions and all civil societies concerned will continue to monitor the practices of Samsung and the Korean government on this issue until justice is completely brought to the victims. 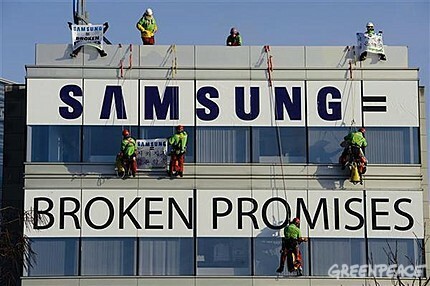 Finally I hope that Samsung Electronics takes the opportunity presented by having admitted culpability in the case of ‘Kim’ a 37 year old former worker, to look again at the way it deals with workers diagnosed with occupational diseases; That the structure of Samsung’s procedures and methods are seriously overhauled. But also that the spirit in which Samsung views and responds to workers diagnosed with life threatening and work related injuries or illnesses begins become more humane. Where is the respect and dignity that the ATNC and SHARPS urge from companies. Samsung’s admission was made shortly after ‘KOSHA concluded in its investigation that the worker ‘Kim’ developed thrombositopenia and anemia because of occupational hazards’. Though Samsung Electronics didn’t really have a choice in the matter, as its hand was forced by KOSHA’s investigation’s conclusion; however it has a choice now to begin to do, finally, the right thing. “In the past few years, there have been several studies pointing to excess cancer risk in semiconductor and computer manufacturing workers”– Dr. R. Clapp (from the email he sent me dated May 27th). “As we all know, the semiconductor industry stands on the cutting edge of technology, science, and knowledge. This cutting edge should also apply to protect workers’ health and their environment.” From Chungsik Yoon’s article “Much Concern but Little Research on Semiconductor Occupational Health Issues” published online May 27, 2012. I emailed the Korean Occupational Safety and Health Agency (KOSHA) twice with specific questions about the report “Cancer Mortality and Incidence in Korean Semiconductor Workers’”written by members of the Korean Occupational safety and Health Institute. I also attempted to contact Samsung. So far I am still waiting to receive a reply.